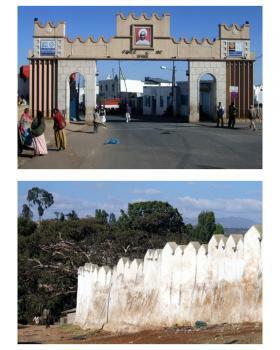 Harar is a fortified historic town in southeastern Ethiopia. It has been a major commercial center, linking African and Islamic trade routes. It is considered "the fourth holiest city of Islam" with 82 mosques and 102 shrines. The Islamic is town characterized by a maze of narrow alleyways and forbidding facades. In the 19th Century Harer (or “Harar”) was one of those “ultimate destinations”, like Timbuctoo and Mecca, whose dangers and inaccessibility, both physical and cultural, fascinated European explorers. It had been at its most powerful in the sixteenth century when its ruler overran much of Ethiopia and was only defeated by a Portuguese intervention on behalf of the Christian king. The city’s layout and walls (The “Jugol”) date back to that time. It claims to be Islam’s “Fourth most holy” city (The “hierarchy” of Islamic cities is an interesting and debatable subject - see also my review of Oudane + Chinguetti in Mauritania! ), and was closed to infidels. Thus it wasn’t until 1854 that Sir Richard Burton became the first European to make the return trip during one of his early forays into East Africa. My interest in the History of Exploration and a number of atmospheric sepia photos in old books I have collected, led to it being added to my “must see” list many years ago. Its inscription on the World Heritage list on 2006 was a bonus! In December 2007 I finally made it but, as so often happens with anticipated and possibly over-romantic expectations, the initial impression was a distinct let down! The “main entrance” to the city is through a rather ugly modern gate (photo) wide enough for traffic and sporting signs both for the UNESCO World Heritage inscription and for receiving the “Cities for Peace” prize in Sept 2004 (This prize was then “abolished” in 2005!). 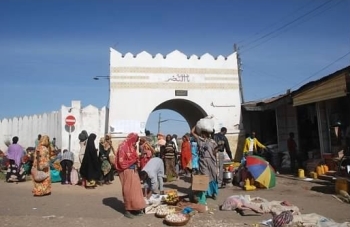 The main square was dominated by a huge painted sign extolling the virtues of not ostracising Aids victims and a half finished monument, which I understand is to hold a statue of Harar’s last (Muslim) ruler, placed somewhat controversially in front of the town’s main Christian church! From there however, you can dive into the city’s back streets. It was inscribed for its vernacular architecture and we had a pleasant afternoon’s walk through the maze of alleyways inside the almost complete walls (photo) criss-crossing to each of the 5 original city gates. The market/commercial areas are relatively small and most of the city has a quiet “residential” atmosphere. The layout of the houses reflects Harari social organisation – a compound is shared by 2 or 3 families. We also saw several of the second “type” of house mentioned in the “Advisory Body evaluation” – The Indian House – built by merchants in the late Nineteenth Century. I can’t say however that it was the most impressive or exciting of medieval cities. Large areas are in a very bad condition – not entirely due to poverty if the ugly satellite dishes sprouting everywhere are anything to go by. Also, there were signs at several of the “Gates” showing incredibly unsightly planned reconstructions. But surely UNESCO will prevent these? Building monuments and inappropriate new gates when the basic infrastructure and many of the houses are falling apart doesn’t seem the wisest course! In the evening we attended the “Hyena Man” performance (just 3 tourists!). This apparently grew out of a tradition of feeding the Hyenas annually – it is a bit “touristy” but I know of nowhere else where you can get so close to these creatures (and feel their power as they grab meat from your handheld stick)! The next morning we joined the congregation for the Sunday service held outside (as is normal in Ethiopia) the Medhane Alem Cathedral. This was built on the site of the main mosque after Menelik II added the city to his empire in 1887 – the subsequent, apparently reasonably peaceful, coexistence of Christians and Muslims in this “holy” Muslim city may indeed well justify the “City of Peace” prize! It was still an independent emirate when Egypt was the first country to annex it in 1875 as part of the Khedive’s “African Empire” adventure. When Britain occupied Egypt in 1882 the city became a virtual British Protectorate for a couple of years before being handed over to a local ruler – the last Emir of Harer. Menelik was then allowed a free hand to expand whilst Britain, France and Italy carved up the coastal areas of the Horn – thus explaining the shape of Ethiopia’s SE frontier. We then visited the, now dilapidated, “Indian House” where Haile Selassie grew up – atmospheric but, in all honesty, not a great deal to see in the single open room. Next, we moved on to the so called “Rimbaud House” where the French poet may (but more likely did not – it was probably a school where he may have taught!) have lived whilst he was in Harer as a trader on and off during the 1880s. This house (it is not specifically mentioned in the evaluation) has recently been lovingly restored (with French money and assistance). Inside, the decorations are European and the beautiful woodwork possibly Indian (?) but the light shining through the coloured glass in the windows and the views over the nearby hills were authentic enough. It is certainly a beautiful house which we really enjoyed visiting. However, the best was yet to come in the form of a visit to a traditional Harari house. Oh, how I wish we had arranged to stay overnight in one of these (as I understand is possible) rather than in our grotty hotel (which seemed typical of all the Harer hotels we tried!) and would advise anyone visiting to try to do so. If not you should certainly arrange a house visit since several are open. In these houses the floor of the main room is raised at several levels which are then occupied according the status of those present. The walls with numerous niches are brightly painted and decorated with Injera dishes, bowls and cups. The house was beautifully kept – whilst outside all was dilapidation! So what of the city? My feelings are rather like those of this (Ethiopian) writer for Ethiomirror.com - even perhaps a bit more positive! I wonder if he is viewing "provincial" and Islamic Harer a bit too much from his Addis and Christian-centred viewpoint! This link will take you to Sir Richard Burton's description of the town (choose Chapter 8) and this one will tell you more about Rimbaud and his time in the city. If you visit you may well feel that large parts of the city haven't changed too much from when Burton and Rimbaud walked those same streets. But that is not really a plus point - "authenticity" does not require decay. At the moment Harer seems to be getting the worst of both worlds - modern rubbish and intrusive developments together with historic decay. There are some gems within but one must fear for the whole. Forbidden City: "Harar was a fiercely religious city and was a forbidden city (closed to visitors), until 1887"
General Gordon: Working for the Egyptian Khedive who had annexed the Emirate as part of his intended "African Empire" he visited Harar in 1878 and dismissed the governor. Wrote to Richard Burton "I wish you could undertake the Government of Zeyla, Hara, and Berberah, and free me of the bother. Why cannot you get two years' leave from F.O., then write (saying it is my suggestion) to H.H., and offer it? I could give, say, ?5,000 a year from London to your Government." Islamic pilgrimage sites: "the fourth holiest city of Islam"